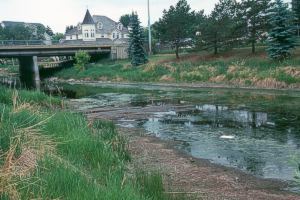 The first photo shows the Sturgeon River at the St. Albert Trail at 1 pm on June 29, 2002. The second photo was taken in the same location at 1 pm the next day, June 30, 2002. 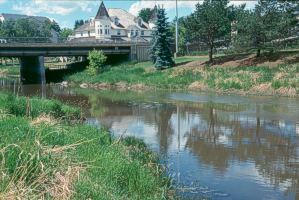 The Sturgeon River reacts quickly to changing events, such as heavy rainfall or removal of a beaver dam. After a prolonged dry spell, a rare rainfall late afternoon and evening of June 29th caused the river to rise quickly. By 1 pm on the 30th it was already dropping again, as shown by trapped fish in the shoreline rocks. BLESS is interested in the water budget for the Sturgeon River drainage basin. More specifically, we are interested in the Big Lake water budget, which is linked closely to the budget for the entire basin. CAUTION The data used for this review were provided by Alberta Environment. However, Alberta Environment is presently reviewing these data, as there is evidently some changes needed in their database. For that reason, viewers are requested not to make any interpretations of the data or the analysis at this time. Thank you for your patience. The first 3 are beyond our control, although dams (including beaver dams), weirs, and other structures can influence outflow to the North Saskatchewan. Some structures adversely affect fish movement and so must be carefully considered. W and A are regulated by the province, although it seems impossible to determine which ground water withdrawals are from aquifers that can recharge the basin. Clearly, in years where precipitation is low and evaporation is high, there can be serious impacts on the water budget, so that water levels drop significantly. For those years in particular, the amounts of water lost to W and A become problematic but are in theory manageable. - there appear to be withdrawals that have not been subject to approval decisions. What can BLESS and others do to remedy this situation? First, BLESS can work with regulatory agencies and the municipalities to promote development of a realistic useable water budget that would provide better guidelines to regulators. Second, BLESS, as Steward of Big Lake, can assist the province in locating withdrawals that have not been reviewed for permits. BLESS has no regulatory authority. We are, however, charged by Alberta with the responsibility to locate and report situations that might threaten the integrity of the lake. Presently, withdrawals approved by Alberta Environment total over 21 million cubic metres per year, of which 8 million are to be returned. We are aware of the importance of "cumulative impacts" on the water integrity of the Big Lake Natural Area. Accordingly, we will be looking closely at all the many contributions to the water balance of Big Lake in particular. In the near future, this page will contain breakdowns of water allocations on a geographical basis. 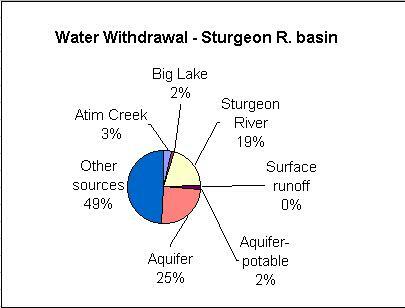 The water approvals data provided by Alberta Environment contain listings for the entire Sturgeon River drainage basin. There may possibly be data from outside the basin due to complexities in the data system but these are being searched out by AE and BLESS. As described above, there may be other issues related to the proper interpretation of these data and Alberta Environment expects to resolve those for us. There are 591 listings, 278 for ground water approvals; the rest being for either surface water approvals or shallow gravel bank sources (called "surface runoff"). A general summary is illustrated in Table 1 (note: this report is subject to review by Alberta Environment; it should not be used for any purpose without the expressed approval of BLESS). 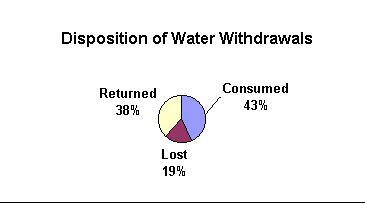 Water withdrawals have three possible dispositions: water can be consumed by the project; water can be lost (e.g. evaporation), or water can be returned (click here for a graphical representation of this). There are 37 listings for water withdrawal approvals naming Atim Creek as the source (23 of these show zero withdrawals). A total of about 725,000 cubic metres are licensed, none of it returned. These include 4 listing City of Spruce Grove as the user, and 5 naming Town of Stony Plain as the user. All of these municipal uses are for flood control, except one for Stony Plain, which is permitted to consume about 190,000 cubic metres for "urban" use. The largest volume licensed is for about 225,000, for "Fishery". There are 19 listings showing Big Lake as the source (7 of these show zero withdrawal). About 335,000 are licensed, none of it returned. The largest licensed withdrawal is about 110,000, for a golf course. It appears that some withdrawals from Big Lake are not licensed. There are 104 listings showing the Sturgeon River as the source (28 of these show zero withdrawal). About 4.2 million is licensed for withdrawal and about 400,000 is returned. Twelve permits are for 100,000 or more each. The largest withdrawals are each over 500,000. There are 27 listings for "surface runoff", ranging from 25 to about 75,000 cubic metres, none of it returned. The total amounts to about 84,000, most of it in one permit (74,040) for a golf course. There are 11 listings, totaling about 320,000, with returns of about 70,000. The largest is 216,000 cubic metres per year. There are 256 listings, totaling about 5.1 million cubic metres, with returns totaling about 3.4 million. Those allocated zero total 28. The largest, amounting to almost 1 million is for Town of Stony Plain. A summary of significant "other" sources is found in Table 2. All "other" sources total 137 listings, authorizing 10.2 million cubic metres withdrawal, with about 4.3 million returned. Fifty listings are for zero withdrawal. Thirteen are for more than 200,000 each. Three are for more than 1 million each, two of those on Kilini Creek; the other is a withdrawal from Deadman Lake.